I’m looking for a way to store payloads in database and I’ve read on this forum that good way to do it is to subscribe to MQTT topic. 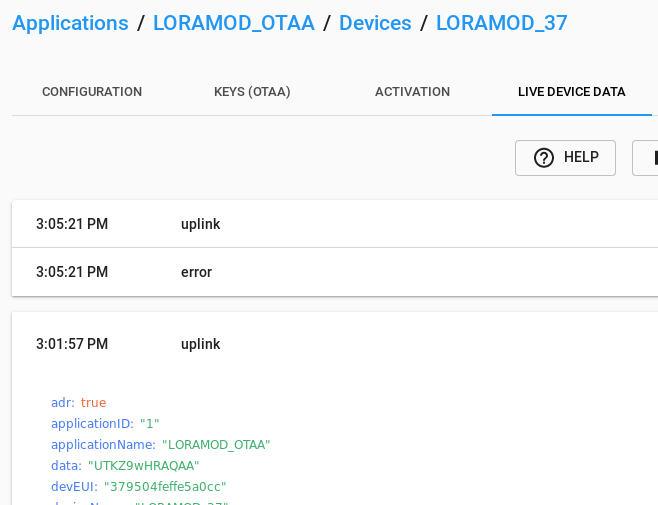 I have LoRa stack installed by default docker installator. Host machine is Debian. I have MQTT up and running on default 1883 port. Try subscribing to ‘application/#’ in case you got the application id wrong (it should be in the URL of the page you were viewing before). Or for that matter just subscribe to ‘#’ and see everything including the raw encrypted packets to/from gateways and various housekeeping. Unless you have a huge number of devices nearby it won’t be an extreme flood and will give you some sense of what is / isn’t working. Perhaps you connected to the wrong broker? You aren’t specifying to presumably it assumes localhost and a default port. And don’t run mosquitto_sub as root. There’s no reason to - at most the broker would need privileged port access. The client does not; any permission issues are between the client and broker and related plug-ins, not between the client and the host os. Seems like you may have multiple brokers running, with the data going to a different one. mosquitto_sub works perfectly from outside the server, but within it - no data. Checking with nmap -p 1883 I can see that from outside this port looks open, from inside it’s… filtered. And these filters are applied by LoRa/docker containers - is there any way to change them?